The old familiar song of the Western meadowlark floating across Fountain Flats was the herald of spring to me. Even though the several past days have been delayeringly (I made up that word and I like it, so I had to use it again) warm and sunny, and the snow has melted extensively everywhere, I hadn’t come to the realization of spring until several days ago. The bluebird day was complemented by the first small flock of mountain bluebirds which guided our car down the road as they flew from plow-stake to plow-stake in front of us. Killdeers called out their territories harshly. Hairy woodpeckers were heard drumming on the loudest dead tree they could find. 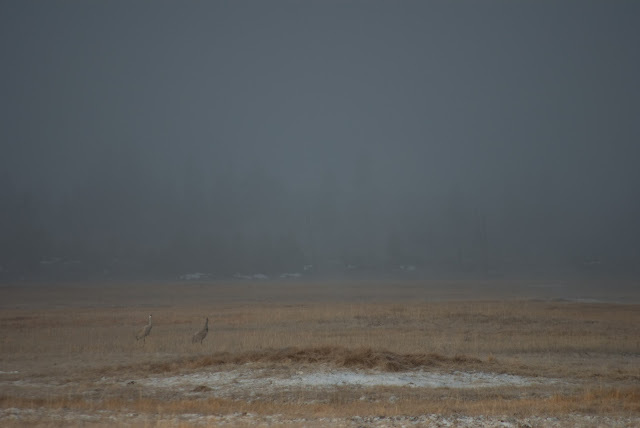 The first sandhill crane pair flew in to Fountain Flats without making a sound. 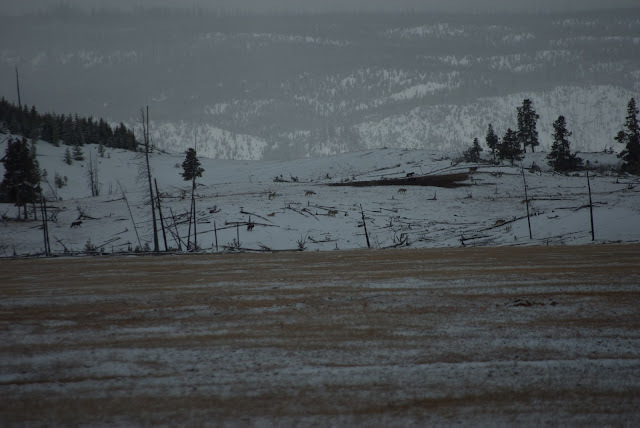 The bison have flooded into the study area, seeking those now snow-free meadows where they clip the miniscule amount of new green leaves that are growing up and through last year’s matted old growth. I have even found the tiniest of flowers growing in Pocket Basin, where the thermally heated ground gets a head start on the growing season. 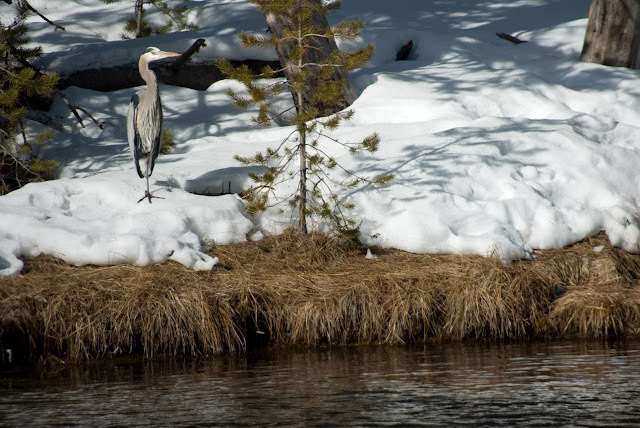 Everything that has life-blood, whether it be critters or plants, is being released from their winter-induced dormancies and captivities and are beginning new processes and behaviors. 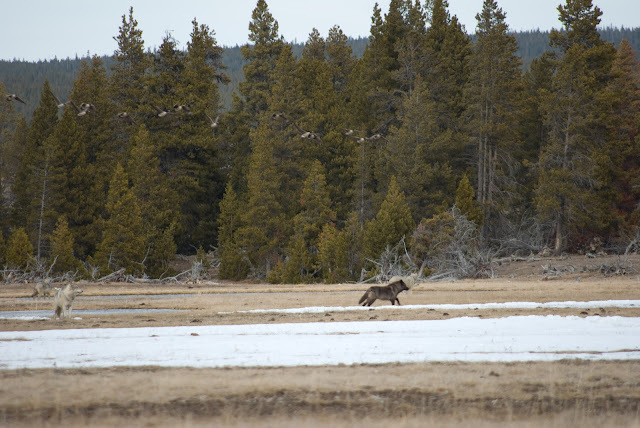 It is great to witness these changes in Yellowstone. Even with all these springtime mood-enhancers and everything’s-getting-better-now-that-summer-is-on-the-way boosters, the wolves are still hungry, and the elk and bison, between bouts of “yippee”-heel-kicks, must still be wary. 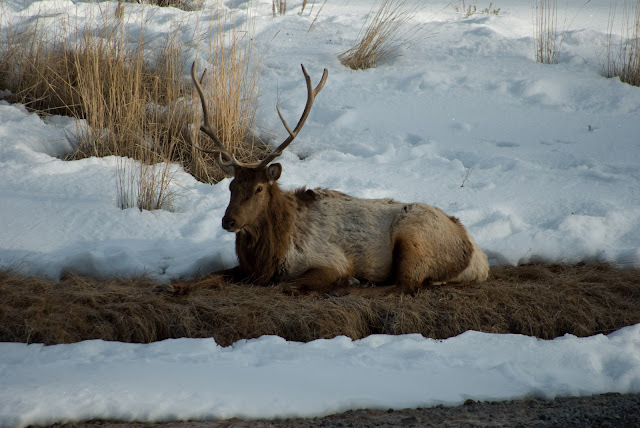 My hopes of seeing all our collared elk survive the winter season have been dashed. On a trip to Mammoth, Megan and Greg (our newest member of the crew for the rest of the season) decided to listen for our one migratory collared elk (she originally wintered in the Madison, but with wolf pressure, became migratory, moving to Mammoth before the winter season and returning in the summer). The signal came back as a mortality (our collars are designed to send out a different signal if there has been no movement by the animal for several hours). After hiking in to the signal, they found the collar by a small lake. The kill had been made probably mid-winter. Not two days later, we received a mortality signal from one of the eight remaining collars in the Madison. 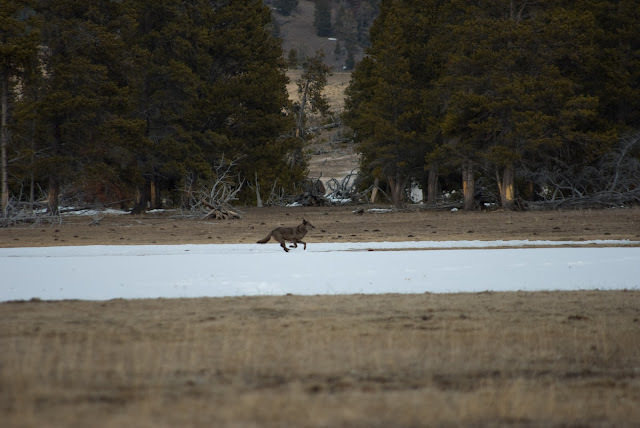 The newly collared “Madison” pack had taken her down not far from Terrace Springs. There was only her collar, a front leg, and her mandibles left, everything else had been consumed, even her hide. 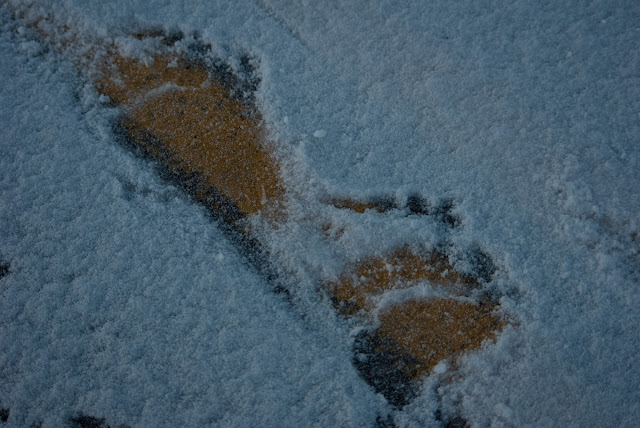 The melting snow also revealed an interesting specimen. 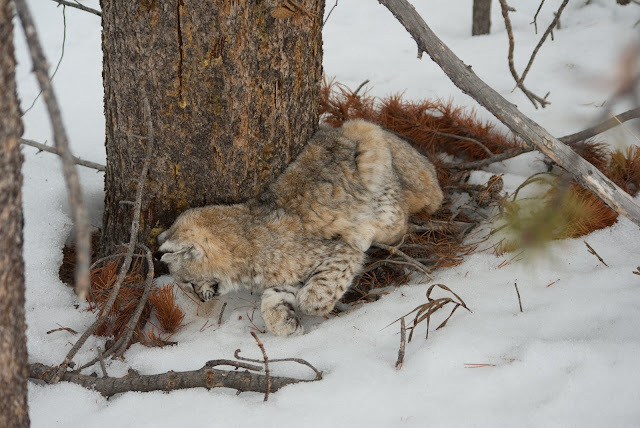 A bobcat had died next to a tree just off the road in the Madison early in the winter season and had been then covered with several months’ worth of snow. 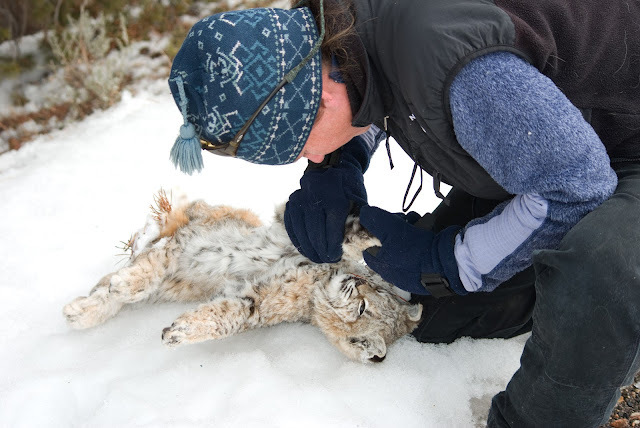 The receding snow uncovered the bobcat to the greedy (or, more appropriately, curious) eyes and hands of us biologists. We necropsied the carcass (thereby destroying its beautiful coat, which felt somehow sinful) to determine its cause of death, but found nothing indicative. Hemorrhaging was found along the shoulder blade, but nowhere else. It was a she, and she appeared to be small, possibly last spring’s kitten. 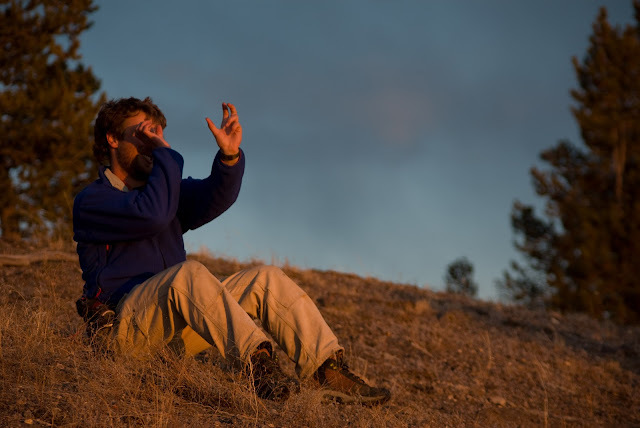 Several days ago, Greg (the new guy) and I were going about our normal routine, checking wolf and elk signals up the Firehole. 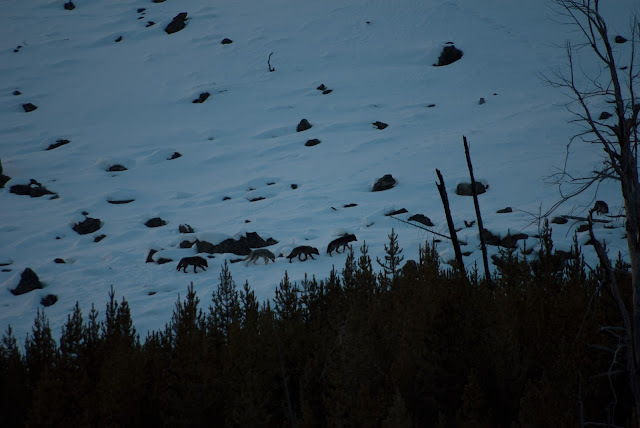 After stopping at the Firehole campground and listening to a few frequencies, a very loud, emphatic, hollow howl emanated from the trees across the river. Another wolf joined in as Greg and I looked at each other in amazement. It wasn’t that we hadn’t heard howling before. I had heard countless howls since I’ve been here, but being so close to the source of the howl is something quite different. Luckily there was a river between us and the wolf, otherwise my animal-response would have been to high-tail it out of there. After the initial surprise, the low, drawn out howl actually seemed to become therapeutic. Maybe that’s why they howl? How many wolves can you count? 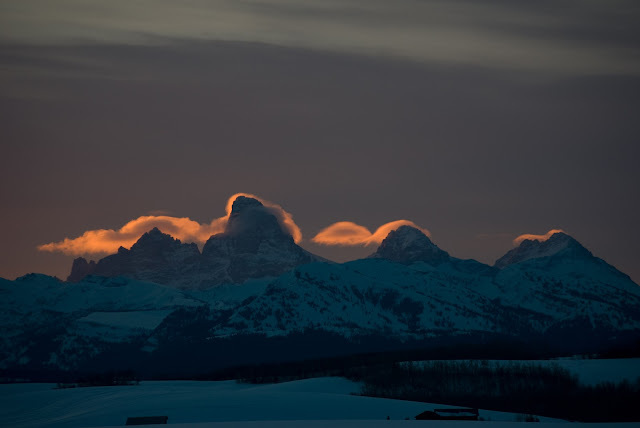 We continued down the road to our next stop, and climbed up Porcupine Hill, our best promontory for checking signals and getting a sunrise view of Fountain Flats. From about half-way up the hill, a chorus of wolves began howling. This was more than just a small acapella group; this was a full choir; baritones, bass, and tenors, and every form of bark and yip echoed throughout the open meadows. Through a rolling fog bank in the distance, I spotted some wolves. With my binoculars to my eyes, the wolves multiplied. Sprawled out before us, some laying lazily around, some standing at attention, an army of eleven…no, fourteen…wait, fifteen wolves lifted their long noses to the sky. Their song was not sung for the world, but meant for a specific audience. 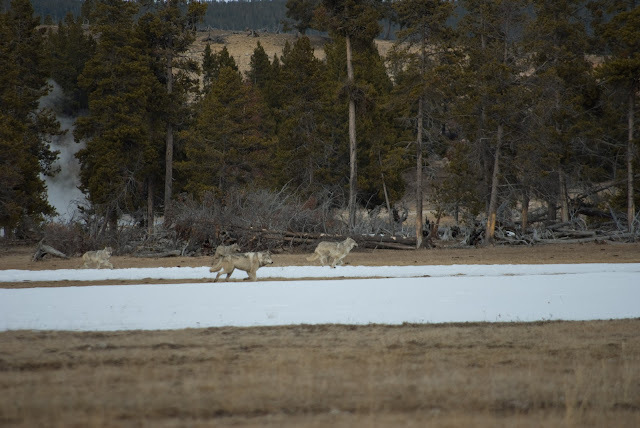 On the other side of Porcupine Hill, Greg spotted four more wolves on a bison calf carcass that had fallen into a hot spring. They returned some howls to the pack of fifteen (the Gibbon pack). Neither pack made any move toward or away from the other, but just remained listening, then howling, then listening. What were they saying? We would continue to spot the fifteen Gibbon wolves during the next few days; once in Sentinel Meadows (all conked out sleeping, scattered everywhere like a bag of spilt rice, once in front of Pocket Basin shadowing a herd of bison, and another time running in front of us not 100 meters away. The size of the pack is bewildering and awesome every time. As of yesterday, the Gibbon pack has had two more collars added to the pack, giving us a total of three collars instead of the one. 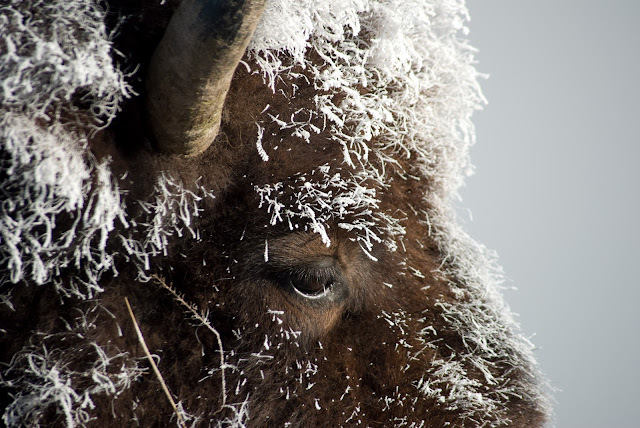 Our last weekend's bison survey resulted in approximately 850 bison, which is double from early season counts. My brother and his girlfriend, Cara, were able to join us for the bison counting festivities. Along with the hundreds of bison we counted in the Madison, we also found a fresh bison kill in Cougar Meadows, complete with grizzly bear and wolf tracks. It was a bison kill that had had its skull completely broken, probably from a good open-paw slap to the face by a grizzly bear. What's wrong with this coyote? Anyone? Anyone? "Madison" Pack before disappearing from our study area. One of only two bulls in our study area. 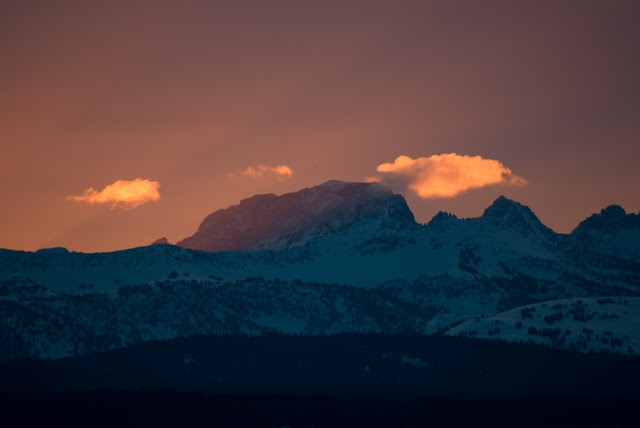 Can anyone name that mountain? Good Samaritans Luke and Cara tried to save the life of this Great Horned Owl on their way to Yellowstone. It had apparently been hit by a car and was surrounded by ravenous ravens when they found it. They handed it over to the Grizzly and Wolf Discovery Center in West Yellowstone, but unfortunately, it died the next day. Guess this mountain: Mt Haines? 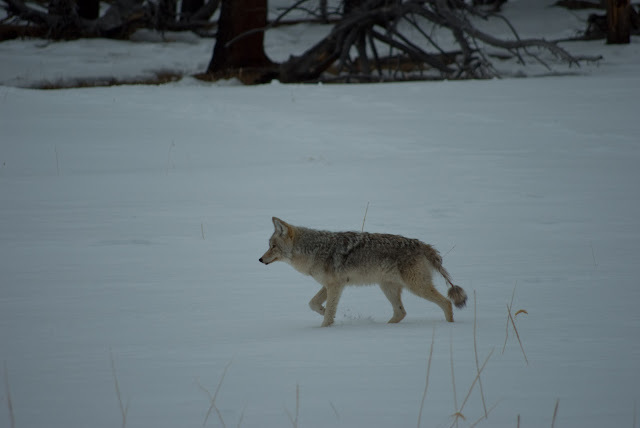 What is wrong with this coyote: mange evidenced on the tail? Guess this Mountain: Mt. Moran! For the Coyote: I bet he narrowly escaped death by the skin of his tail? One hip Mama is having second thoughts about walking alone on the centerline. Poor bobcat. Any chance it was hit by a car while crossing the road? I'm a bit of a bobcat fanatic and have been lucky enough to watch a family of them that live within walking distance of my house here in Southern California. They are very cool animals. While unlikely, I hope to get a glimpse of one in Yellowstone in a month. We definitely were looking for evidence of the bobcat being hit by a car, but there were none. Hemhorraging was not extensive enough, nor was there any outward or inward disfigurements. Good luck finding the bobcats!